This mug features the great seal of Baltimore. A farmer and a fisherman, who symbolize Lord Baltimore's two estates in the new world (Maryland and Avalon, Newfoundland), support the shield of arms. Saginaw is a city in Michigan and the county seat of Saginaw County. This is a souvenir mug of the 7th infantry division, National Guard New York. 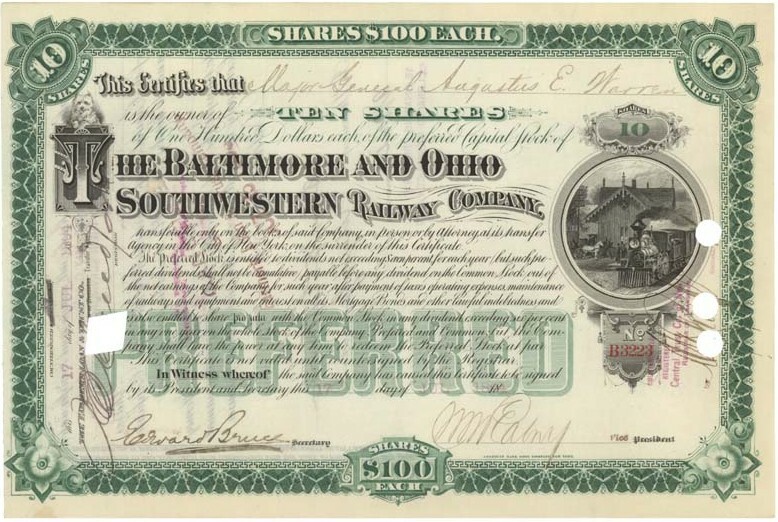 In 1889, the Cincinnati, Washington & Baltimore (CW & B) railroad from Belpre to Cincinnati, was renamed the Baltimore & Ohio Southwestern (B&O SW). By 1893, the B&O SW was absorbed by the Ohio & Mississippi railroad, which gave the B&O a connection to St. Louis. By 1900, the B&O SW disappeared into the rest of the system. James Kennedy was a U.S. Representative from Ohio. He was born in Lowellville, Ohio, in 1853, prepared for college at Poland Union Seminary, in Ohio, and graduated from Westminster College, New Wilmington, Pennsylvania, in 1876. Kennedy studied law and was admitted to the bar in March 1879. He commenced to practice law in Youngstown, Ohio, where he also served as a member of the city council from April 1886 to November 1888. In 1894, he served as chairman of the Republican State convention at Steubenville, Ohio. He was elected as a Republican to the Fifty-eighth and to the three succeeding Congresses (March 4, 1903-March 3, 1911). He was an unsuccessful candidate for reelection in 1910, to the Sixty-second Congress. 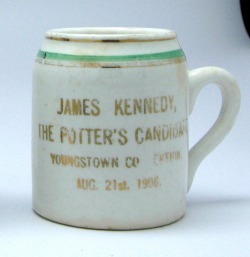 Kennedy resumed the practice of his profession in Youngstown. 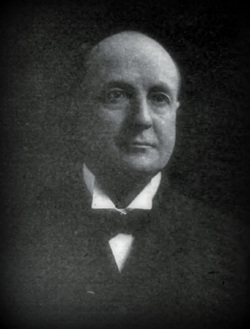 He later became affiliated with the Democratic Party in 1916, and unsuccessfully ran as a Democratic candidate for election in 1926, to the Seventieth Congress. He died in Youngstown on November 9, 1928. 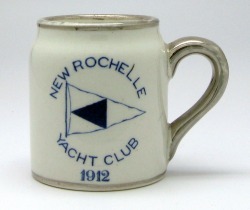 The New Rochelle Yacht Club was organized in 1885 on Echo Island "up the Sound" with a view of the water which separates Long Island from New York. According to the September 1891 Frank Leslie's Popular Monthly, its fleet regularly held regattas with a list of entries that included the Atlantic, the Larchmont, the Seawanhaka, and New York. Osakis, Minnesota was founded in 1857 situated on the southwest shores of Lake Osakis.. Celebrating Norwich's 250th anniversary as a city. Norwich was founded in 1659. This cobalt demitasse stein has hand applied Sterling silver overlay. 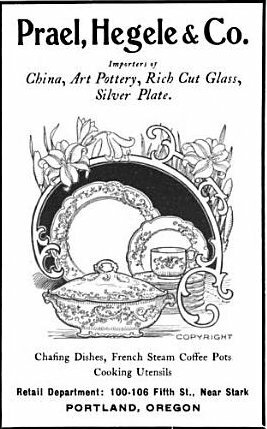 In 1889 Oscar Pierre Erard of Birmingham, England developed a method of electroplating silver on glass and porcelain. Although beautiful on the outside, its shortcoming was that the reverse side of the silver next to the glass tarnished. In 1893, John H. Scharling from New Jersey, patented a method of electroplating that would not tarnish. By 1895, the Czechs, Italians, French and Austrians also produced high-end glassware with sterling deposit and overlay. From 1895 to the late 1920s, silver overlay and silver deposit were regarded as exquisite gifts or accent pieces. However, the Great Depression forced many of the glass companies to either go out of business or manufacture less expensive glassware. Thus the application of sterling silver overlay virtually ended by the mid-1930s. Merry Christmas 1931, C.W. Ferguson, Versailles, Indiana. Shows view of the White House on the opposite side. Mugs shows Mt. Vernon, home of Washington on one side and the Capital in Washington D.C.
Washington D.C. souvenir mug with monk drinking a bottle of wine. Niagara Falls consists of three waterfalls which straddle the international border between Ontario, Canada and New York. From largest to smallest, the three falls consist of the ﻿﻿Horseshoe Falls﻿﻿, the American Falls and the Bridal Veil Falls. The Horseshoe Falls lie mostly on the Canadian side and the American Falls entirely on the American side, separated by Goat Island. The smaller Bridal Veil Falls is also located on the American side, separated from the other waterfalls by Luna Island. The international boundary line was originally drawn through Horseshoe Falls in 1819, but the boundary has long been in dispute due to natural erosion and construction. Niagara Falls State Park first opened in 1885 is New York's oldest state park. It is composed of an area on main land, and five islands on the Niagara River. Today, it covers more than 400 acres with nature and bike trails, paths, picnic facilities, and other activities and attractions. Asheville is a city in and the county seat﻿ of Buncombe County, North Carolina. It is the principal city in the four-county Ashville metropolitan area, with a population of 424,858 in 2010. Prior to 1909, Oregon was known as "the Webfoot State"due to the large amounts of rain Oregon receives. The "Webfoot State" nickname is said to have originated with a group of Massachusetts fishermen who helped General George Washington defeat the British. When their ancestors migrated west of the Cascades and settled the Willamette Valley in the mid 1800s, the "Webfooter" name came with them. Bottom showing Prael, Hegele & Co., Villeroy & Boch and Made in Germany marks. Prael, Hegele & Co. were wholesale dealers in crockery, china, glassware, art metal, art pottery and other house furnishings. The company was known as Charles Hegele & Co. from 1886 to 1900. Rudolph F. Prael joined Hegele in 1886 as a bookkeeper and became president in 1900. The company's name was then changed to Prael, Hegele & Co.. It was located on Thirteenth and Hoyt streets in Portland, Oregon. Around 1920, the building where the company operated was converted into a transfer and storage facility. No information could be found on this mug. The only reference to a Charles Dawson I found was a Chas. Dawson, who operated a coal mine in Oak Hill, Illinois near Springfield. This appears to be a souvenir mug but may have stood for something unknown. The Nobles County Court House was built in 1877 at a cost of $1,124 on a block of land granted by the railroad in the heart of Worthington, Minnesota. In 1894, a new courthouse was built at a cost of $42,469. This structure was three-story's tall and made of red brick with a massive stone foundation featuring a tower and elaborate cornice work. The building was replaced during the 1970s with a new court house. Oakland is a major West Coast port city in the state of California. The Port of Oakland is the busiest port for San Francisco Bay and all of Northern California. The city was Incorporated in 1852, and is the county seat of Alameda County. Lookout, Wisconsin was a small farming community located approximately 37 miles south of Eu Claire.